The IRS announced some good news for certain taxpayers. 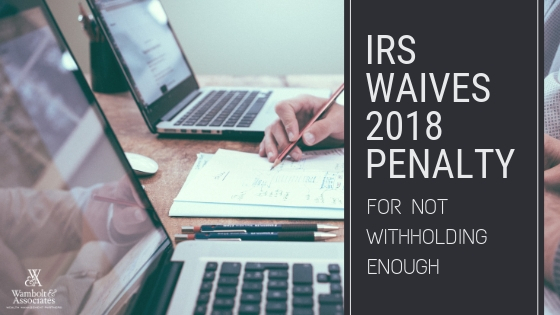 It is waiving underpayment penalties for certain taxpayers whose 2018 federal income withholding and estimated tax payments fell short of total taxes owed for the year. The estimated tax penalty will be waived for those taxpayers that have at least paid 85 percent of their total tax liability through withholdings and quarterly payments. The waiver recognizes that the Tax Cuts and Jobs Act (TCJA), enacted in December 2017, brought with it a bevy of changes for taxpayers. These changes made it difficult for some taxpayers to determine what to withhold. Among the changes was the amount of withholdings as calculated by revised tax tables. When the revised tax brackets were released under the new tax plan, many taxpayers calculated lower withholdings assuming less taxes owed. But the problem that arose was that other factors such as dependency exemptions and itemized deductions didn’t factor into the revised withholding tables. For waiver purposes only, the announcement relief lowers the 90 percent threshold to 85 percent. This means that a taxpayer will not owe a penalty if they paid at least 85 percent of their total 2018 tax liability. If the taxpayer paid less than 85 percent, then they are not eligible for the waiver and the penalty will be calculated as it normally would be, using the 90 percent threshold. For further details, see Notice 2019-11, posted today on IRS.gov.